A bid to raise enough money to keep a painting at an Oxford college has failed after it was sold at auction. The former editor of the Guardian Alan Rusbridger wanted to raise £8,000, so the portrait of the murdered Irish model Eileen Henry by William Strang could stay at Lady Margaret Hall. However, 1% of the figure was raised, and it was sold by its owner at Mallams in Oxford for £6,500. Henry was shot by the artist John Currie in 1914. Mr Rusbridger, who is principal of the college, started the crowdfunding page 24 hours before the auction. He said it was "always going to be a very tall order" to crowdfund the money in time, and that he had only heard about the auction two days ago. "We gave it a go but sadly time wasn't on our side and the moment has passed," he said. Mr Rusbridger described the painting as a "resource to reflect on sexual violence, obsession, the role of the 'muse' and changing ideas of female sexuality". Mr Rusbridger said Currie and Henry were in a relationship, but that he abused her. She ran away before Currie stalked her to her new address, spent the night with her, and shot her. He then shot himself and died from his wounds three days later, his last words were reportedly being, "It was all so ugly". It is thought Henry sat for the painting for Strang shortly before her death. 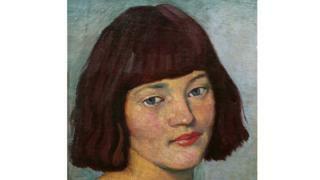 The painting, which was sold to a London gallery, had an estimate of £3,000 - £5,000.